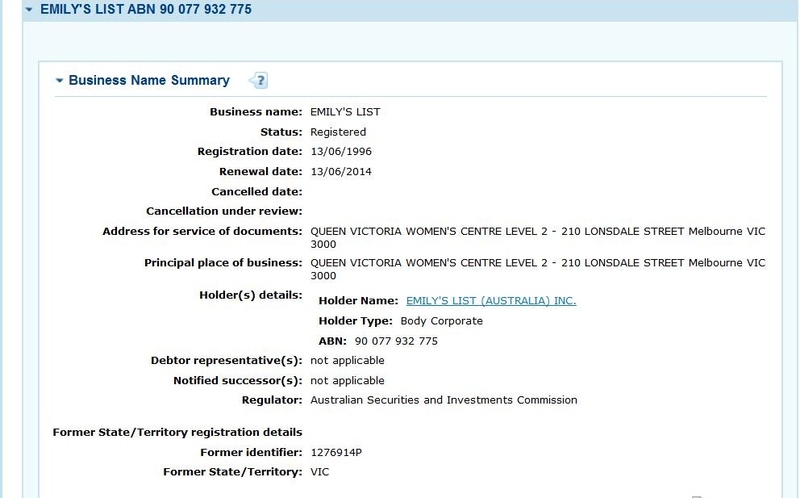 An organisation called Emily’s List was set up in 1996 by Julia Gillard and an Australian Securities & Investments Commission (ASIC) search says it is still in her name. At the time she set it up various police forces had or were investigating the “AWU slush fund” she had set up for her then boyfriend Bruce Wilson. We all know that the AWU slush fund was not a slush fund as Julia Gillard had claimed but used to funnel fraudulently gained money though by Mr Wilson. Emily’s List website is very clear in that its major function is to raise money to help female politicians to get elected and I do not have a problem with that. But I find it disturbing that the Prime Minister is still showing up on ASIC as the one who controls it, at least in name. I spoke to one of Julia Gillard’s media spokespeople this afternoon and they did not have an issue with it. I suppose there is nothing wrong with it legally or ethically but to me it leaves open the perception that she might use her position as Prime Minister to raise money for an organisation she can deregister at any time. I would have thought once she became a politician it would have been transferred into someone else’s name if only for perception sake. If you click on the below pictures it will enlarge them and make it easier to read. (Click here to see on the ASIC website) You need to click on Julia Gillard’s name on the ASIC site. Click on the arrow below to listen to Julia Gillard talk about Emily’s List. At the 2.15 minute mark she starts talking about setting up Emily’s List when she was at Slater & Gordon. Emily’s list was set up in 1996 and Julia Gillard was elected in 1998 to federal parliament, so her incentive to help set it up was obvious. I wonder how much Emily’s list money was used to help her get elected. There is a lot of criticism of Emily’s List online but it is only a small part of the Labor Party and I believe that most of that criticism is misplaced and/or wrong and should be more accurately directed at the Labor Party as a whole. A regular reader brought the above to my attention. 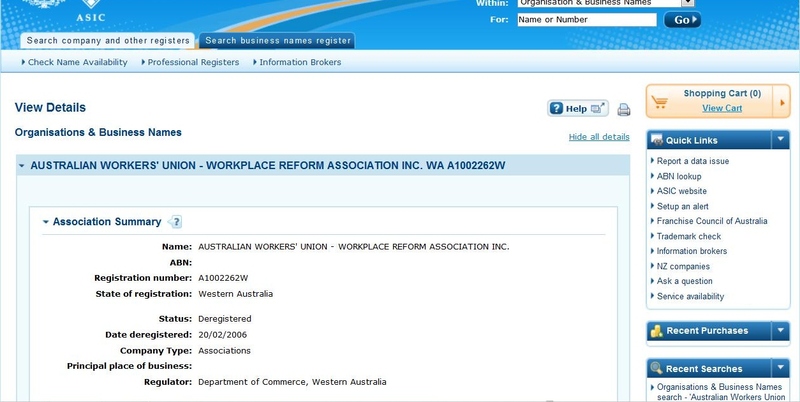 They also pointed out that the Australian Workers Union Workplace Reform Association that Julia Gillard set up in the early 1990’s and was used by her then boyfriend Bruce Wilson to rip off the AWU was only deregistered in 2006. This seems strange as police investigations were conducted in 1996 and the AWU knew it was a dodgy association then as well. It would have been up to Bruce Wilson and/or Ralph Blewitt to deregister it as it was in their names. But one would assume there would have been nothing to stop the AWU from deregistering it given that it was a sham association. Maybe that is something for Bill Ludwig and the AWU to explain. (Click here to see on the ASIC website) Click on the top one where it says deregistered on the ASIC site. As well as the questions that I have already raised, the bottom line to the above is that I have heard no criticism of the constitution and rules of Emily’s List so how can Julia Gillard say she got it so badly wrong with the Australian Workers Union Workplace Reform Association. Update 19/10/12: Julia Gillard’s Register of Members’ Interests document. It says she is a member of Emily’s List on page 9. It makes no mention that Emily’s List is registered in her name. (Click here to read her members interest document) Thanks to one of the regular readers for bring this to my attention. ← Julia Gillard and Bruce Wilson AWU fraud investigation gathers pace. Posted on Facebook …thank you for that !! Why has this not been mentioned by the Media? Does this intefere with her duties as PM? Could there be any conflict of interest? Does this mean she has a group other than UNIONS to back her in an Election? I think a Prime Minister should not be involved with outside interests, especially if she is able to benefit in ANY WAY, politically or financially! I assume that you know that Emilys stands for “Early money is like yeast”. I intend to assist with funding your business. You are a breath of fresh air in our deplorable political system. Kind regards, Mary Aspinall-Conn.
Slater & Gordon have apparently lost the file on Julia Gillard. They should be suspended from business until it is found. Gillard should be removed to the Back Bench until this is all over. Then if anything underhanded is found, charges should be laid. I’m fed up with all this stuffing around. How convenient they lost the file! !This saga just keeps on going on with no tangible action from prosecutors re fraudulent actions.!! In view of the type of women in the ALP and Greens seem to attract – do we really need to encourage any more of the same? Don’t thinks so. The women in the aforemention seem to be causing enough trouble. As a women, I don’t think gender should be of importance, the quality and experience of a person, ethics etc., is more important than gender. Emily’s List are pro choice and a number of people made comments who obviously anti-abortion which I allowed. I then asked people not to comment on that further as it is off topic for this post and site. A couple of others did make comments on it, so to be fair I have deleted all the comments on that matter. While this issue is important, it is off topic for this site which is judicial corruption and this site is here to get a result and drive change in that area. That is why I have deleted those comments. This has the hallmarks of climate change! Throw in the diversion – global warming or in this case Abortion! Dupe the people and Siphon of the funds for feathering Nests. Sorry for mentioning the word Shane just thinking outside the square. support of Emily’s List, they will need to agree, to agree with the mantra of Emily’s List. It is not about gaining the rights of freedom of choice, as our society already has that, the Australian Emily’s List is all about manipulation of a woman’s freedom of choice, in that to gain support from this organisation they have to agree to and vote in favour abortion. And once a woman agrees to be sponsored by this group, they have her vote, locked in on any issue. There are Atheists world wide, mainly to the Left, and Emily’s List, Australia, is nil, but a Labor manipulation. The existence of orgs like Emily’s List is the history of politics. Catholics were historically also pretty good at seeking the advancement of fellow like-minded travelers at the expense of those with alternative views. The issue here isn’t what Emily’s List represents, its the issue of future Prime Ministers setting up organizations purporting to be something they aren’t for seemingly less than honest reasons. I guess its an unintended consequence on Shane’s part, but this Post has been instructive on the topic of how the various external groups that seek to influence/dominate/control our political process organize. Emily’s List, Fabian Society, various Green lobbies, religious groups, business lobbies etc. It does help to learn about the deeper allegiances of those who seek our votes. We have in the past known very little about our politicians, judiciary, media operators etc., and that’s how they liked it. A little food and a little entertainment is all that is required he replied..
Nick Styant-Browne also said in the Age (The man who said to much) that she didn’t leave S&G till May 96 (8 months later). So she must of been setting it up while she still had a Certificate and still with S&G. THE VICTORIAN LAW SOCIETY MAY BE INTERESTED IN THE DATE OF REGISTRAITION. I HOPE THEY READ THIS BLOG. Gillard left Slater and Gordon in October or November, 1995 and remained unemployed for almost six months eventually getting another job in May 1996 as Chief of Staff to Brumby. During that time she allowd her practising certificate to lapse. After many attempts, Gillard won pre-selection for the safe Labor seat of Lalor in 1998. That six months that she was unemployed has miraculously disappeared off her bio! TO RENEW HER PRACTISING CERTIFICATE GILLARD WOULD HAVE HAD TO PROVIDE DETAIL OF HER LAST EMPLOYER AND HER REASON FOR LEAVING. I BELIEVE THAT IS THE REASON SHE ALLOWED HER CERTIFICATE TO LAPSE…..SHE HAD NO OTHER CHOICE. I AM SURE SLATER & GORDON THOUGHT THEY HAD SEEN THE LAST OF HER WHEN THEY SLAMMED THE DOOR AS SHE LEFT. NOT SO, SHE WILL HAUNT THIS COMPANY FOREVER. WITH ALL THE INFORMATION TO HAND, IT IS TRULY INCREDIBLE THAT THIS WOMAN BECAME PRIME MINISTER OR SHOULD I SAY MONSTER OF AUSTRALIA. I did my best to promote their ‘philosophies’ in the lead up to the last election but couldn’t get anyone to pick it up and run with it… Pleased to see that it is now being brought to the attention of the general public… Keep up the good work. Also I haven’t seen it said here, so if it has been, please ignore this, but Emilys List was a US organisation that Gizzard and her band of man haters set up in Australia… and to my knowledge it still exists in the US also. Very interesting that “Emily’s list” was registered in 1996 when Gillard had been sacked from Slater & Gordon in October/November the year before (1995). It must had been registered in 1995. Still having “Emily’s list” in her name (Julia Gillard) while still being prime minister is a conflict of interest. Six months having a “hidden” unemployment record, now this “Emily’s list” being registered in 1996 by Julia Gillard from Slater & Gordon but there was no Julia Gillard working for Slater & Gordon in 1996!!!. Something strange is going on. HOPE SOMEONE WILL LOOK INTO THIS……..
You have to wonder what is going on in Australia. With all these allegations against her, and very little investigation into her actions, one wonders just how deep the corruption has gone . Apart from a few blogs such as this , the silence from police , lawyers, anti-criminal organisations,etc etc etc , is deafening. This is the “Prime Minister” of the country !!!!!! The mind boggles……….. Many in Australia must be feeling abandoned by their own country. And now she’s spent $25million plus bribing our way into UN Security Council for only a 2-year stint. Surely not a good buy. Not too fussy how she funds her various slush fund endeavours. Let’s wait and see who she appoints as the incumbent. My tip is a sinecure for old Bob Carr.until she loses the election and takes it back for her own. 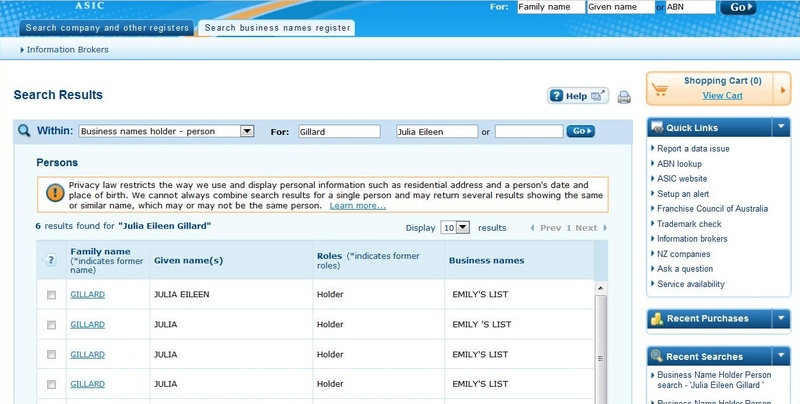 If Gillard is the “holder” of Emily’s list Inc, I wonder if it has money in the bank, and if so, has Gillard declared her stake in it on her pecuniary interests? Are details of MP’s pecuniary interests able to be accessed anywhere? Law firms do not lose files,they are purloined by dodgy people. Law firms usually keep files for 7 years for inactive clients. Longer for existing clients. File distruction is not so easy in this century though. IS IT POSSIBLE THAT GILLARD SET UP MORE SLUSH FUNDS THAT WE HAVE NOT YET BECOME AWARE OF? You can back it in. Greedy people with a nest egg to devour seldom stop with some funds. Mr Michael Williamson is alleged to have favourably treated 20 MILLION $’s. This is big money—————family, architects,council contacts at Randwick————–it just goes on and on. Some people are born well, ———others challanged. Nahh, impossible, she was young and naive, remember. In light of this EMILY’s List, seems to me that there is something to be said about the women who currently have high positions in our Labor (Labour) Gov. With some 3,000 members, are the likes of Roxon, Plibersek and Wong all members and beneficeries of this EMILY’s list?, and what about the woman within the Greens and the Liberals are they members who have benefited financially, if so, what are the long term motives behind this group, obviously, based on the info Ive read so far, they are all pro feminists who are determined to change the balance of the gender status-quo within the system and beyond. I dont have a problem with gender equality, but I do when it’s instigated by woman in power with an extreme feministic ego based agenda. This EMILY’s list needs to be more transparent, due to the level of power that has ties to what it stands for, I don’t believe it is working for the greater good of all Australians. Her legal skills? REALLY? that’s hilarious! That women has skills alright..but being well bought up, I won’t go there. My parents taught me to be polite! I do not like this at all. I cannot believe that the situation of the government in this country is looking worse by the day. How can we find out what the financial situation in regard to the members this Emily’s List is. should be NON political and not there to help the ALP when it needs votes. How can we have confidence in a PM who thinks all these people deserve her support. Hi shane . I have been following your work for many months now & appreciate what you are doing. Not Emil’s list working against Tony Abbott from the time Gillard was confirmed as PM in Feb 2012.See Attatchment. With Julia Gillards dubious past this could easily be looked at as a funding for bribery for Julia Gillard to become Prime Sinister! How mant times have I seen facades set-up to dupe people! The truth these days is One rare species, almost extinct! MY ADVICE TO SLATER & GORDON PROTECT THIS WOMAN NO LONGER. SHE IS A HUMAN WRECKING BALL WHERE EVER SHE GOES CHAOS WILL FOLLOW. I HAVE BEEN ON THIS EARTH FOR A LONG TIME AND I HAVE MET ONLY ONE PERSON A DEVIOUS. MAYBE I HAVE BEEN LUCKY. Pollies on list. http://www.emilyslist.org.au/our-mps. No Roxon??? Knows where too many skeletons are buried and who to trust near her wallet? Thanks for this Shane. It’s interesting to come to this slushy/association for workplace safety from another angle. Obviously the PM knows how to set one up legally so makes you be very skeptical of the intent when Gillard set up the Wilson/Blewit slushy. I have updated the above post with a copy of Julia Gillard’s Register of Members’ Interests PDF. I looked up “Emily’s List on Google” and it would appear that the sole ambition of Madam Gillard is to have the country run by women and she calls Tony Abbott a sexist. The hypocryte should go back to Barry Island in South Wales the dump would suit her “Queen of Barry Island” she could muster up followers to start a campain for home rule for Barry Island. I have an advantage over most Australians I have been there and when I left I was hoping it would sink. Allan Myalup WA. Keep the pressure on as I am sure the truth will come out and the corruption fully exposed. Just because the name is not on this does not IMO mean no involvement in fact it makes it more dubious. It IMO should state names of body corporates and associations.Always should have . After all what is there to hide re business ? One would think people would be proud rather than secretive when it involves finances and or decent cause or decent reason. So in 1994, at a Labor women’s conference, it was announced, that a Australian version of Emily’s List, would be created. And Ms Gillard, by 1996, when it’s actual formation was announced, was a prime mover within the organisation. Where did the funds come from to set up this organisation? Is it possible, that funds from the AWU fraud scandal, found their way, into the foundations of the Australian Emily’s List? Not all of, but part of. Shane, I hope that Australians who are unaware of the the major reason for the existence of Emily’s List will take a little time to research what the major commitment is that applicants must guarantee to support before being eligible for funding assistance to get into Parliament. Please, google Emily’s List and read ALL the detail. Mary Aspinall-Conn.
Shane, Gillard’s pecuniary interests register indicates her “spouse” has an interest in a seafood company, but further down she claims her spouse has “Nil” liabilities. He must be the only person in business or otherwise anywhere that does not owe a single cent. He must not have a credit card even, let alone any business loans etc. So he is a totally kept man then with Gillard picking up all his bills? Didn’t he leave Queensland under a cloud with outstanding debts?